This lesson is going to familiarize you with the chord tones within the scale patterns. Yes, that’s right now you have to learn the notes instead of blazing trough patterns. Why should you learn them… Because these are the color tones. 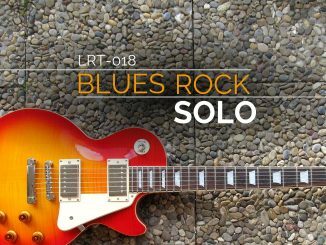 The tones that make the scale and chord progression melt into one harmonious melody, or electrifying solo. So without further adieu… the charts! Let’s start by taking the Dominant 7th chords in the Key of G. If you can’t read my chord charts here’s how. The numbers on the left of the diagram represent the fret numbers. The numbers on the diagram represent the degree of the major scale that the notes are. Example: 5= D (the 5th) on the G7 diagram. To play it just place your fingers where the numbers are on the diagram. Now let’s find the chord tones on the fretboard and compare it to the Mixolydian Mode. You might ask why the Mixolydian Mode. It is because when you play Dominant 7th chords, the Mixolydian Mode fits the best because it gives you the flatted 7th note which gives Dominant 7th chords their sound. I didn’t chart out C7 and D7 in relation to C Mixolydian and D Mixolydian, but I figured that you could figure out how to do this on your own. 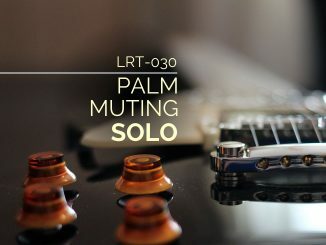 Now that you have studied the relationship of the chord tones to the scale pattern you should try soloing with these notes for that bluesy feel that you get from playing the Mixolydian mode. Sound Hard?? It really isn’t, all you have to do is think of the chord tones. Play the chord tones as opposed to the scale. Use the other scale tones that are not chord tones as links to get a smooth transition from one note to the next. Try using slides, hammer-ons, and trills from a scale note to a chord note. This will bring out the flavor in the chords. I really like hitting on the I chord’s (G7) 3rd degree note, in this case it’s B. 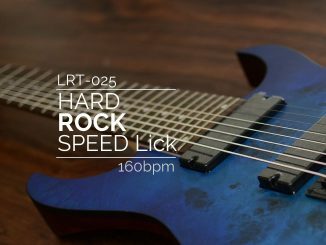 It has a bluesy sound that the Mixolydian Mode and Dominant 7th chords really bring out. As you can see the Blues Scale only contains the root and the flatted 7th note. 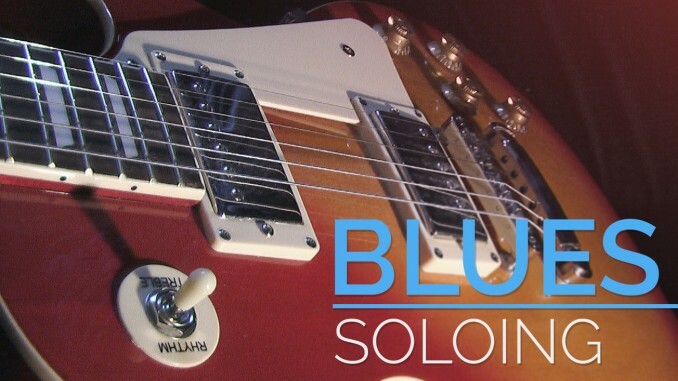 So now the question is why do you use the Blues Scale? I’ll show you with more charts. What you want to notice is that the chord tones for G7, C7, and D7 come together to form the Minor Pentatonic Scale, which is the Blues Scale without the added #4 (which is the only note that is not contained in any of the chords). After looking at the changes in the the modes you must look at the 12 bar blues (shown below). When the chords change from G7 to C7, try hammering from B to Bb. By doing this you will accentuate the chord change because G7 has a B while C7 has a Bb. You will also play the only note that is different between the G Mixolydian and C Mixolydian Modes. To bring out the C7 chord try playing the chord tones to further accentuate the C7 chord. When the chords change from C7 back to G7, try going from B♭ to B, then playing the G7 chord tones. Once again you will have accentuated the chord change. When the chords change from C7 to D7, try going from F to F#, then play the D7 chord tones. Unlike the other chord changes this one leaves 2 changes in the notes of the modes. I like to use the F♯ because it is also a chord tone, and it does a better job in accentuating the D7 chord. Are you getting the hang of my technique? The basic formula is to play the note change then play the chord tones. All you have to know is the 12 bar blues and the change in the notes. 12 Bar Blues Sounds Your browser does not support the audio element.